Charquicán is a Chilean dish, a beef stew that is slow-cooked with squash and potatoes. It was traditionally prepared with dried beef (charqui). This version has both stewing beef and some commercial beef jerky (or make your own), which adds a nice smoky flavor and makes the stew seem more like chili. The squash falls apart as it cooks and helps to thicken the broth. You can add any vegetables you have on hand - beans and corn are common. You can make this stew in a crockpot or simmer it on the stove. 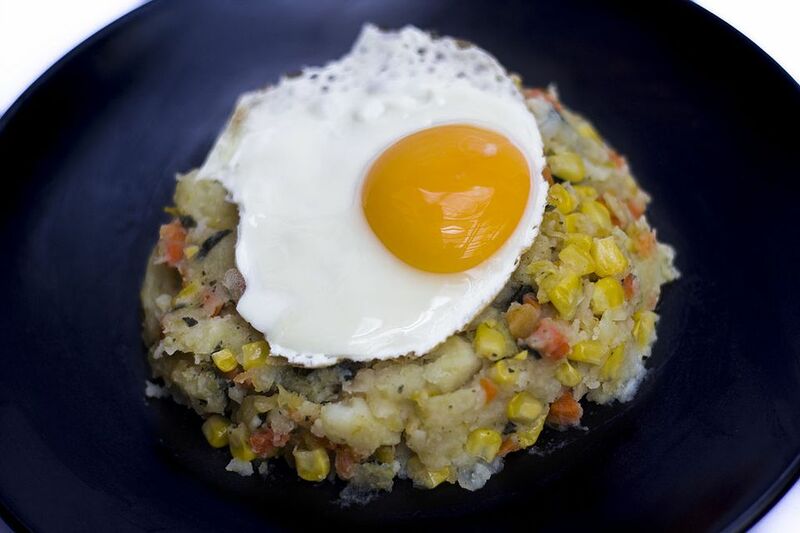 In Chile, charquicán is often served topped with a fried egg. Toss the cubes of beef with the flour and season with salt and pepper. Melt the 2 tablespoons of butter in a heavy skillet over medium-high heat. Sauté the cubes of beef until browned. Add the beef stock to the skillet and bring to a simmer over low heat. Chop the beef jerky into small pieces and add to the beef stock and beef cubes. Simmer gently for about 5 minutes. Transfer beef and beef stock to a large stockpot or slow cooker. Do not clean skillet. Add 2 tablespoons vegetable oil, the chopped onion and garlic, and the aji chile pepper paste to the skillet. Sauté until the onion and garlic are soft and fragrant. Add the chopped squash, carrots, and potatoes and sauté for 2-3 minutes. Add sautéed vegetables to the stockpot or crockpot with the beef. Simmer over low heat until beef and beef jerky are tender, about an hour and a half on the stove or about 6 hours in the crockpot. If simmering the stew on the stove, you may need to add more liquid (beef stock or water) from time to time, but stew should finish up very thick, without much broth. Add the lima beans and corn and simmer for 10-15 minutes more. Season with salt and pepper to taste, and serve over rice.